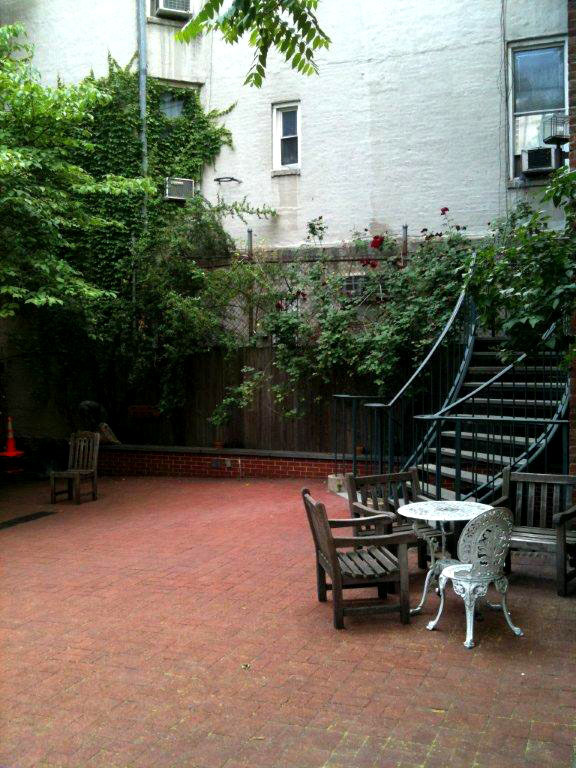 After hurricane Irene downed four mature trees at Hartley House last season, the courtyard was in desperate need of new plantings. 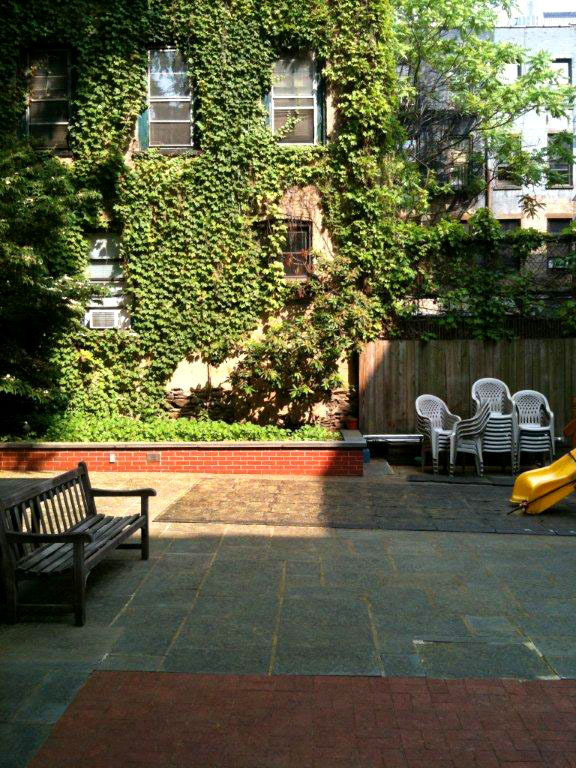 Jeffrey Erb Landscape Design volunteered to provide a full design for the courtyard in an effort to reclaim the space and fill the void the trees left behind. Though the courtyard benefits from gracious donations of annual flowers on a yearly basis, we knew that it needed more this year to make an impact in the space. Alan Klein headed a garden committee to coordinate the replanting of the largest planting bed in the courtyard. After the committee raised enough funds for the installation of an automatic irrigation system, Jeffrey Erb Landscape Design donated additional labor and assisted in obtaining plant materials to make the funds stretch to cover the full installation of the planting bed. The plantings, installed just after July 4th, feature perennial flowers, shrubs and vines which will continue growing year after year. Just a small portion in the front of the planting bed was reserved as a place for annual flowers. We want to thank family, friends and neighbors who donated to this cause. We couldn’t be more proud to play a role in helping a community center which makes a difference in the lives of so many families in Hell’s Kitchen. We will continue to donate time to care for the plants and hope to raise additional funds to continue greening the courtyard at Hartley House in the future. Memorial day is a time to remember the lives given by those who served our country in the line of duty. At the onset of summer, as festivities and patriotic spirits are lifted, we gather with family and loved ones we are thankful to have in our lives. There is no doubt in my mind that Central Park is swamped with picnics and gatherings on this gorgeous day. I want to take a moment to remember Frederick Law Olmsted and his contribution to our city. Central Park (and Prospect Park) is an inconic landmark of New York City which continues to make a significant impact on the lives of Manhattanites and visitors alike. The sea of green which Olmsted approached with the viewpoint of creating a public space equally accessible for all classes was truly visionary at the time. A stunning penthouse on Central Park West overlooks the classic landscape that Olmsted left behind. Our task was to channel Olmsted’s vision to create a terrace that complements the views and surrounding landscape. The result is a timeless garden full of understated textures and greenery to produce a calm place for the homeowners to entertain and relax. Watch the video to see the transformation! For all of you wondering how you can join us to get your hands dirty and get your garden on….this is for you! In the end of August 2011 New York City was girding for an evacuation of low-lying areas from fear of flooding due to Hurricane Irene. For most of us city dwellers the storm was relatively anticlimactic, bringing only a bit of rain and wind. Jeffrey Erb Landscape Design provided a pro bono consultation to our neighborhood community center, Hartley House, one week before Irene’s visit. During that meeting, one of our chief concerns was for a pair of Ailanthus trees growing in the courtyard which had never been pruned properly. This invasive species, known for being unstable, raised fears for the wellbeing of surrounding historic buildings of Hartley House, and for the children attending afterschool and summer programs in the courtyard. If you are already a reader of Erbology, you know how this story (and storm) ended, as chronicled in When Heaven Came Crashing Down on September 7, 2011. Thankfully no one was hurt, and the property damage was minimal. The courtyard plantings suffered the worst with multiple beds and plantings being demolished and requiring removal. We are ready to start the next chapter for the courtyard. Alan Klein has taken the initiative as chairman of the newly formed Hartley House Garden Committee. 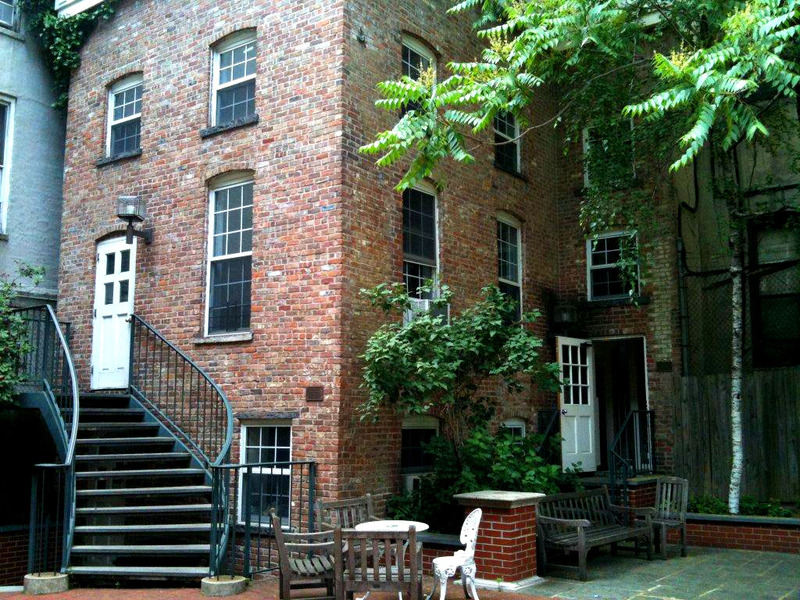 This group is tasked with a fundraising effort to help restore and replant the courtyard between the main building of Hartley House and the original 1800’s carriage house hidden behind. Jeffrey Erb Landscape Design is donating a new design and installation materials while Alan works closely with Hartley House staff members on fundraising for this effort. We welcome contributions and support of all shapes and sizes. Volunteers will be needed for our June planting (check back soon for dates and times) and contributions of any amount will be greatly appreciated. Don’t miss this chance to be involved and to give back to an amazing community organization. Sun tea is easiest and most refreshing way to make a drink while incorporating some herbs from your garden. It’s so easy that you can bring the ingredients with you to a park and let them soak while preparing for a picnic or get together. The drink will be ready when your guests start to arrive. How does sun tea relate to the garden you ask? Herbs is how! When using the recipe below, add a handful of herbs to the brew as it is steeping for a fresh-from-the-garden taste. Mint, lemon balm, sage and even lavender are perfect choices but the options are endless! Stick with one flavor, mint for example, or add several sprigs of different kinds of herbs to create your own, individual brew. Adding some fruit, such as lemon, strawberries or blueberries, can also bring a new flavor dimension to the tea. 1. Wash your container with hot soapy water before use. This will help sanitize the container as the brewing temperature is ideal for bacteria growth and you want to nip that in the bud before it begins! 2. Measure out how many cups of cold water can fit in your freshly washed container. Add 1 tea bag, or loose tea leaf, per cup of water. Also at this time add any herbs or fruit you want. 3. Combine everything in your container, cover, and put in the sun for at least 2 hours. Remove from the sun when the tea has brewed to the strength you desire. 5. Serve chilled with a fresh sprig of herbs! Happy Fourth of July to everybody! Amsonia (also known as Bluestar) is an underutilized native wildflower you should consider adding to your perennial beds. Two species widely found in retail nurseries and garden centers include Amsonia hubrichtii and Amsonia tabernaemontana. These species are very similar but the latter has wider leaves in addition to tongue-twisting binomial nomenclature. Amsonia provides three seasons of interest in the garden. Clusters of small star-shaped flowers in shades of blue cover the plant in June. The blooms peak at a time in the season when many perennials are on a flowering hiatus. 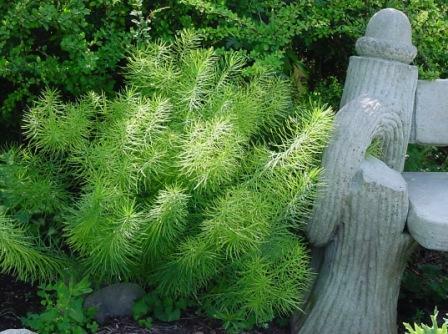 The bright green foliage lasts through summer and has a striking fine texture not commonly found on herbaceous perennials. 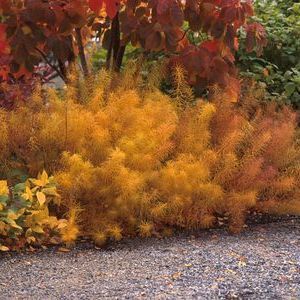 Amsonia provides an additional season of interest with a glowing fall color. The vivid yellow-orange leaves are a highlight in the autumn landscape. Reaching a height and width of about 2-3 feet, Bluestar can easily find a home in the garden. It thrives in sunny locations and can tolerate poor soils and drought conditions. Bluestar will steal the show on its own, but a mass planting would be absolutely stunning. Article and photography by lilyofthevalley for Jeffrey Erb Landscape Design. 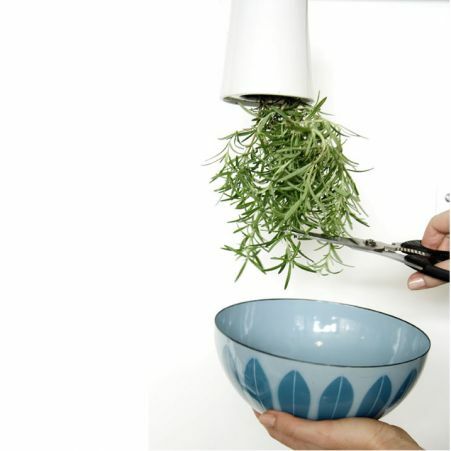 The Boskke Sky Planter redefines the Topsy Turvy Planter collection into a posh container that can fit into any New York City kitchen. Never underestimate the value of fresh-cut herbs. If cooking isn’t your forte, think beverages. 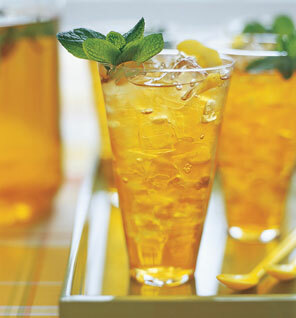 A little minty mojito could be the norm in your kitchen this summer. 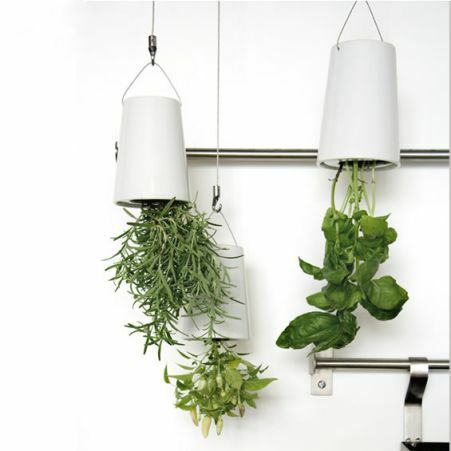 An innovative watering system allows the plants to be watered without leaking onto your countertops and floors. Have fun arranging individual planters at convenient heights in your apartment. To maximize visual interest of these planters, stagger the hanging heights for a layered effect. 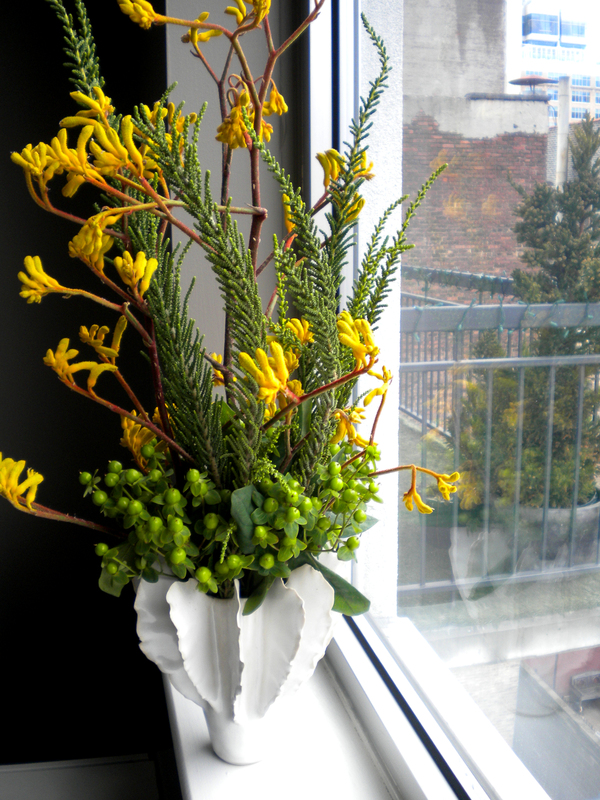 Herbs best suited for growing in a sunny window include rosemary, mint, basil, oregano, thyme, chives, dill, fennel, and sage but don’t limit your imagination! There are many options available and when one plant becomes bare, replace it with a different variety! 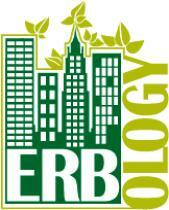 Article written by lilyofthevalley for Jeffrey Erb Landscape Design. Spring is in full swing. After an inspirational retreat to Puerto Rico, we are back in action and ready to start a slew of spring projects. Watch for my articles on the tropical rainforest, local nurseries stocked with stunning bromeliads and the critique of the University of Puerto Rico Botanical Garden.